This drill is from my personal collection. There is a significant difference in the material used for construction of this drill in comparison to later models of No. 2A-1957. I have written an article about MF No. 2A-1957 Transitional model here. 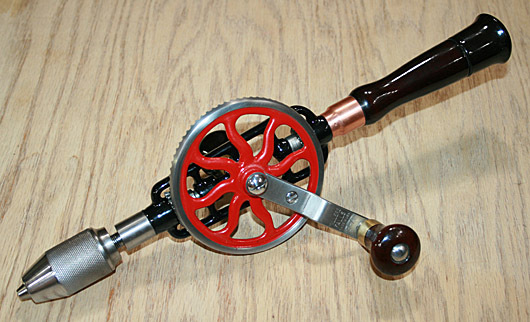 Single speed hand drill with two pinions. Die cast, iron frame is enameled black. 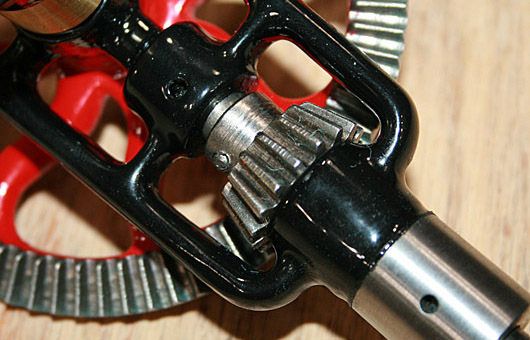 Drive gear is painted red. 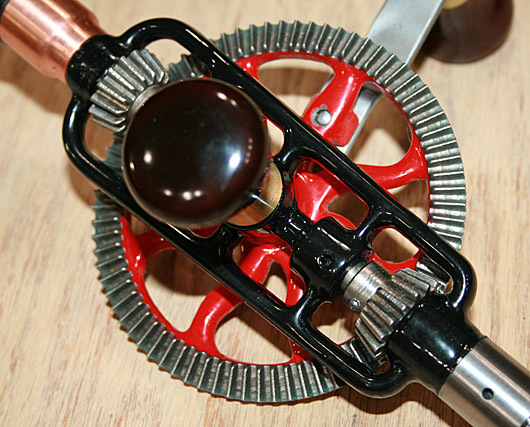 Tropical hardwood main handle with hollow storage for drill bits and cap. 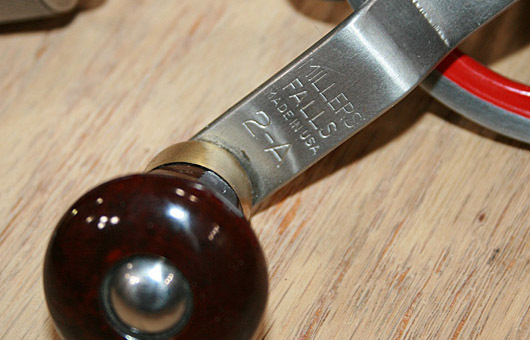 "Chef's cap" side handle. 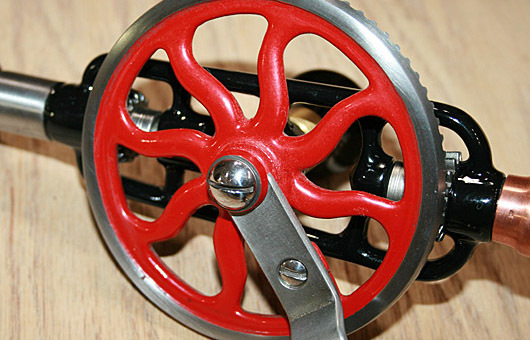 Ball thrust bearing on spindle. 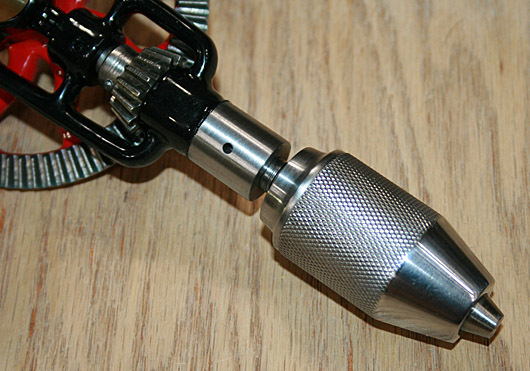 Three-jaw, spring chuck adjustable from 0 to 3/8 inch. Bright parts nickel plated. Main frame fully stripped, re-painted and baked. 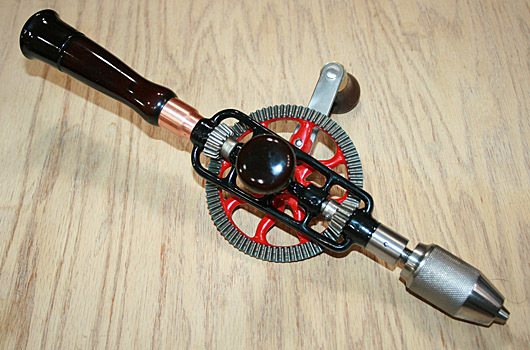 Side and crank handle sanded, re-stained with red mahogany and painted with 3 layers of lacquer. Main handle sanded polished and treated with 3 layers of lacquer. Gear tight and very smooth. Chuck disassembled, cleaned inside and out. All inside surfaces polished, including jaws – for smooth operation. Greased, oiled, tuned and checked.